The V4 frame is equipped with rails that allow lateral front-to-back movement. It is equipped with a Logykal box, Lince2 software, a 100 kg Hyperaxis cylinder and a 6-point harness. will tend the harnesses by your shoulders making you feel a breaking close to reality. Before this new innovation of the JCL’s innovation, the only braking feeling was the pressure exerted on your brake pedal, now you will feel the braking also with your body like in real! The V4 frame is adaptable to all JCL brand chassis but also to all chassis made of aluminum profiles. 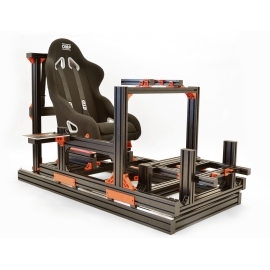 For this we just need to know the width of your chassis to design it to measure. You can also attach 2 to 4 Hyperaxis cylinders of 100 kg or 2 to 4 D-box cylinders. V4 dynamic Frame There are 4 products.